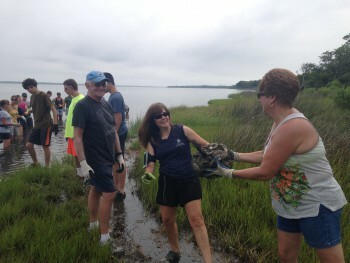 Volunteers again gathered at Trinity Center in Pine Knoll Shores to put down oyster bags for a marsh toe revetment that will eventually extend 500 feet along the shore. Building off the progress made June 1, this group of 34 volunteers put down 500 oyster bags to extend the revetment to 225 feet. For the past few years, the North Carolina Coastal Federation has partnered with Trinity Center and Sound to Sea staff to build living shorelines at the center’s property on Bogue Sound. These shorelines help decrease erosion, restore habitat and improve water quality. This particular project is funded by a grant from the National Oceanic and Atmospheric Administration (NOAA). Marsh grasses help buffer wave energy and keep sediment in place, and oyster reefs provide habitat for hundreds of marine animals — including other oysters. A healthy adult oyster can filter up to 50 gallons of water per day. Marsh grasses, along with oysters, also help filter pollutants from water. Together, they help make water cleaner for swimming and fishing.